Come for the retreat. Stay for the weekend. Built in 1903 by lumber baron Frank D. Stout as a summer estate for his family, Stout’s Island Lodge has been frequented by heavy hitters since Carnegie. It’s an unparalleled haven for recharging, unwinding and team building. The phrases “stunning scenery,” “worry-free,” and “private island” aren’t typically associated with corporate meetings. Then again, Stout’s Island Lodge is anything but typical. This rustic paradise offers the perfect setting for a restorative and productive escape. It’s conveniently located just two hours from the Twin Cities, and we have everything you need to get the job done — and have a bit of fun in the process. From the moment of arrival, we make everything effortless. Your guests can arrive in a single group and take a private ferry to the island or arrive individually for our scheduled ferry service. They also have the option of charging food, drinks, and souvenirs to their own room by providing a credit card upon check-in. Any expenses that your company will be covering can easily be charged to a single group account while remaining confidential to your guests. Interested in distributing materials to your guests? We’ll provide them upon check-in or place them in the assigned rooms. At Stout’s Island Lodge, our lodging options are as unique and memorable as our incredible setting. No two rooms are alike. 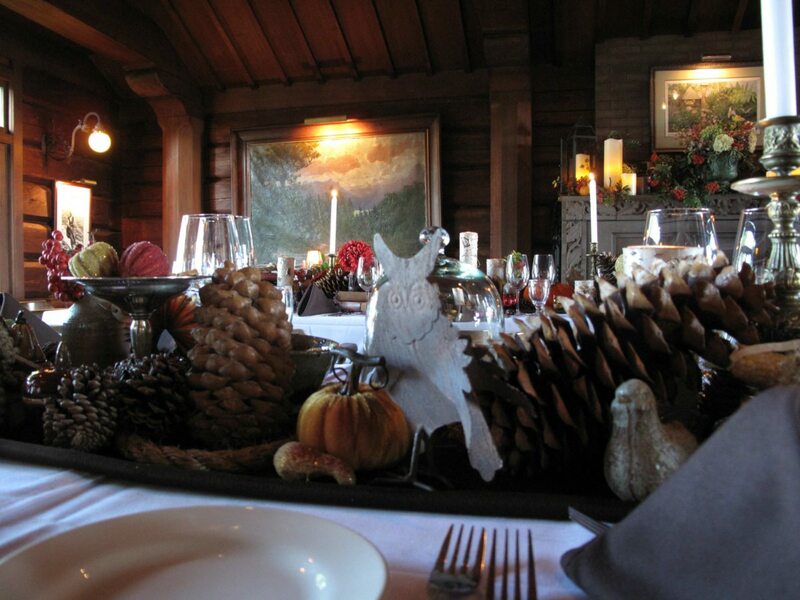 Feel like a lumber baron with the historic charm of the Main Lodge, Harry’s Cabin, Allison’s Cabin, or Gardener’s House. Or, if your tastes run more modern, try Clara’s Cabin, Katherine’s Cabin, Wilson’s Cabin, Douglas’ Cabin or the Shore Lodge. All rooms include a coffee maker, mini-fridge, hair dryer, and beautiful garden or lake views. 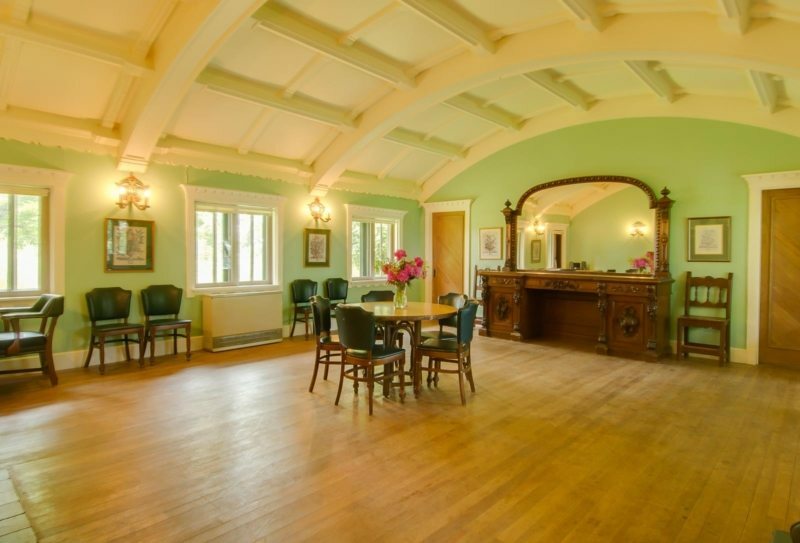 We have 43 individual rooms on the island that accommodate groups of up to 150 people depending on required sleeping arrangements. We offer standard corporate rates on all our rooms, which takes the guess work out of your budget. For pricing details, contact our Event Coordinator at events@stoutsislandlodge.com . View our Rooms page by clicking here. Fondly called “Mrs. Stout’s Room” this room is located just off the lodge’s Great Room. This room, known for its barrel-vaulted ceiling is now used for groups – both for corporate gathering and for private dining. It has a wood-burning fireplace and windows with views to the south. A total of 475 sq ft, this room can see a maximum of 24 adults depending on configuration. 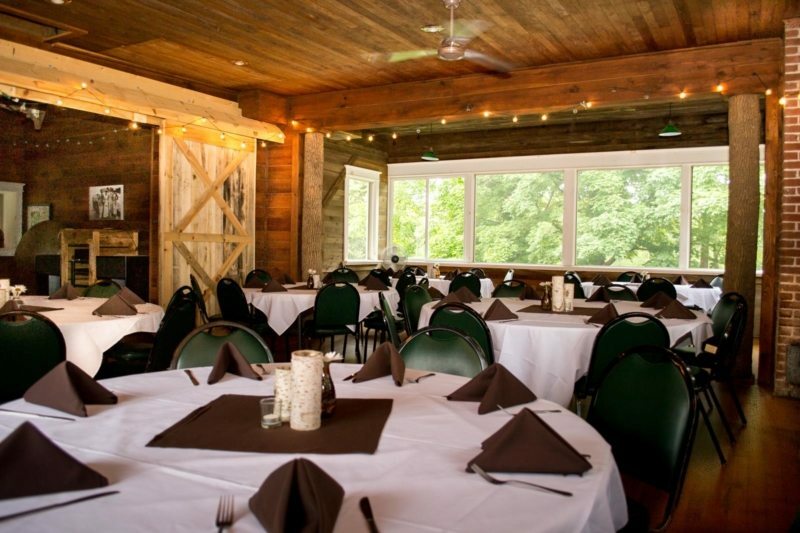 Adjacent to the Main Lodge, the Ice House (1,000 sq ft) and patio are a picturesque location for all kinds of events—from corporate brainstorming sessions to wedding receptions to a 4th of July Family BBQ. A set of solid wood sliding barn-style doors decorate this room along with string lights and a classic-style canoe hanging from the ceiling. The Ice House can host 60 seated guests indoors; more seating is available on the adjacent, outside patio if the weather permits. Our meeting rooms offer a perfect blend of rustic elegance and modern amenities. We have flip charts, projectors, screens, wireless internet, sound equipment and more. Fuel up with delectable snacks hand-made in our on-site, fine dining restaurant. Take your snacks outside and enjoy a breathtaking southern lake vista. We apologize in advance if the fresh air and scenery make it difficult to return to your meeting! Your meals are prepared by our gourmet Chef in our very own island kitchen. We pride ourselves on fresh, upscale, delicious food sourced locally whenever possible. We even grow some of our own vegetables on the island. Select from our catering menu or customize your own menu with the help of our Chef. Buffets and plated meals are available. Breaks and meals can be served in any of our meeting facilities, or even outdoors on the patio or near the tennis court, weather permitting. See our catering menu for details. We make planning simple and offer a Day Meeting package complete with hot breakfast, two snack breaks, and lunch. See catering menu for details. Tired of ice breakers and wary of trust falls? You’ve come to the right place. 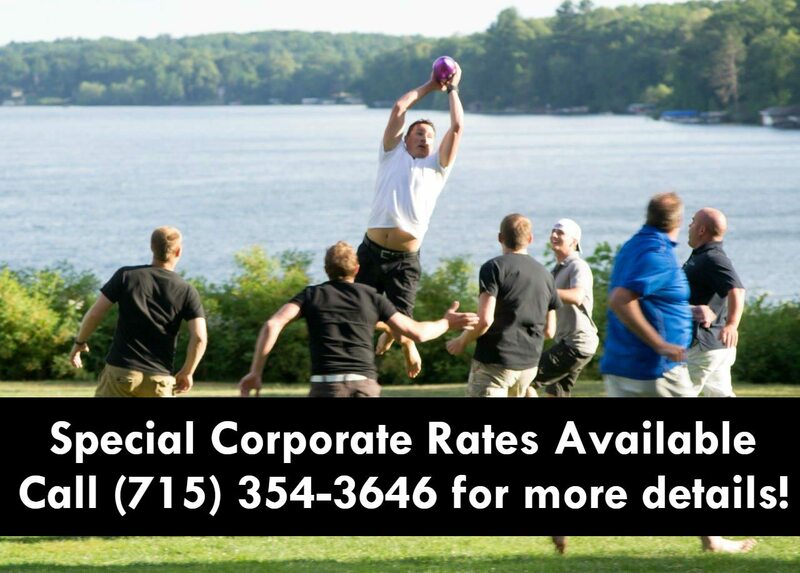 Stout’s provides an unparalleled setting for team building, brainstorming, and reconnecting. The opportunities are endless. A few ideas: Plan your very own amazing race that encourages your guests to explore the island. Break the ice with your own cowboy rodeo complete with hats and roping cattle. Try your luck at our Stout’s Island Scavenger Hunt that reveals secrets of the island’s unique history. This isn’t your average retreat. 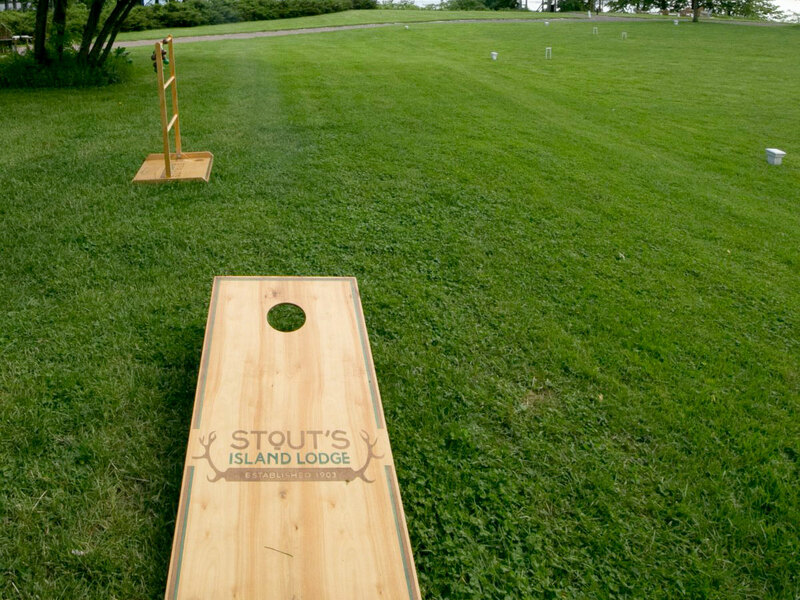 A trip to Stout’s Island Lodge is unique, restorative, fun, productive, and memorable. This is the bestselling Stout’s Island activity—ideal for building stronger teams and making memories. The object of the game is to be the team to complete all seven challenges and win the ingredients to make a s’more. The stations are located all across the island, so it’s the perfect activity to get your group to explore the island without a guided tour. Once a team has all of their ingredients, they must rush to the bonfire area to roast, build, and consume their hard-earned s’more. To signal their win, a member of the team must ring the Island’s bell before any other team. Stations include everything from a memory challenge to water biking around the swim dock! This is truly an experience they will never forget. This activity is one for the books! It begins with every member receiving a bandana and cowboy hat that they must wear during all times of the games (the hats/bandanas can be provided by Stout’s, or you can provide customized items as a keepsake for the event). Once each team ties on their cowboy gear, it’s time for the games to begin. 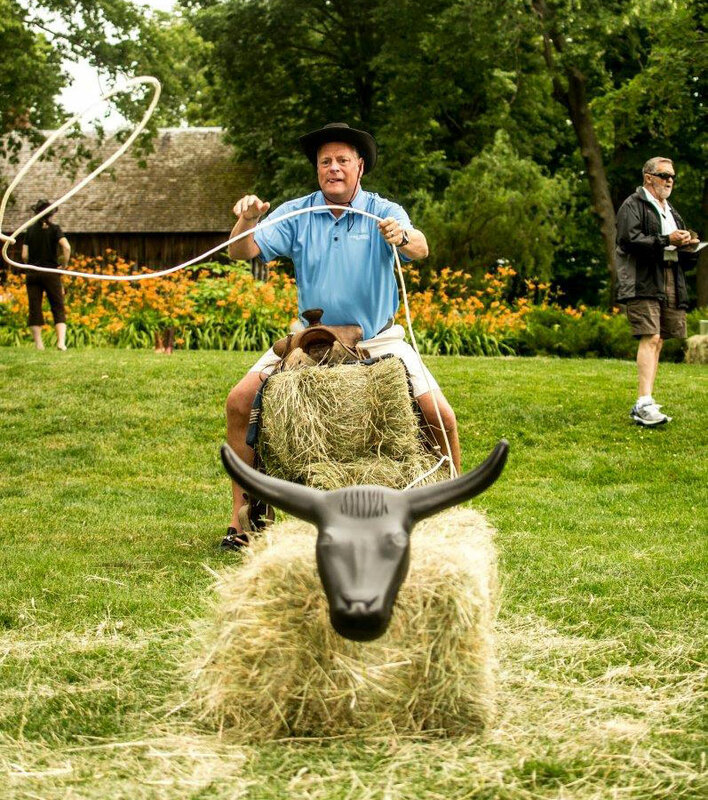 Each team must complete feats of Cowboy/Cowgirl agility at six different stations. Once a station is completed, the team will receive a clue that they will use to find something hidden on the island. The first teams to complete each station, solve all of the clues, and discover the prize wins. Also, at any point in time if a Cowboy/Cowgirl loses his or her hat, a penalty station must be completed before continuing in the western game! This activity is perfect for groups looking for a lower-key atmosphere. It can be completed with your entire group, or you can break off into teams to make it more competitive. Each team will receive a list of riddles that they must solve to take them to objects in hidden locations. The first team to collect all of the objects and make it back to the Main Lodge and ring the bell wins! This activity incorporates fascinating details about the unique history of the Island. 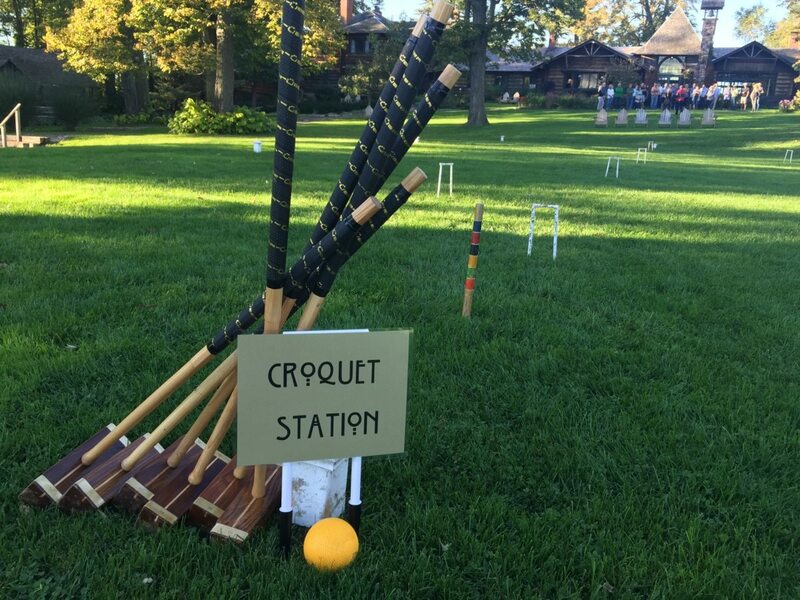 For those with a competitive spirit, the Island has lots of tournament options, including bean bags, bocce ball, tennis, lawn pong, billiards, ping pong, or croquet. All tournament activities can be reserved in advance with your event coordinator, or they are available on a first-come, first-serve basis for non-exclusive events. Coordination and prizes (1st place – 3rd place) are available for your event for a small fee. Once the meeting is wrapped up and it’s time to socialize, indulge in our unique hour-long Elco boat experience complete with drinks, hors d’oeuvres, and a history of the Island and surrounding area. The boat can accommodate up to ten guests and cruises at about 7 mph around the beautiful Red Cedar Lake. 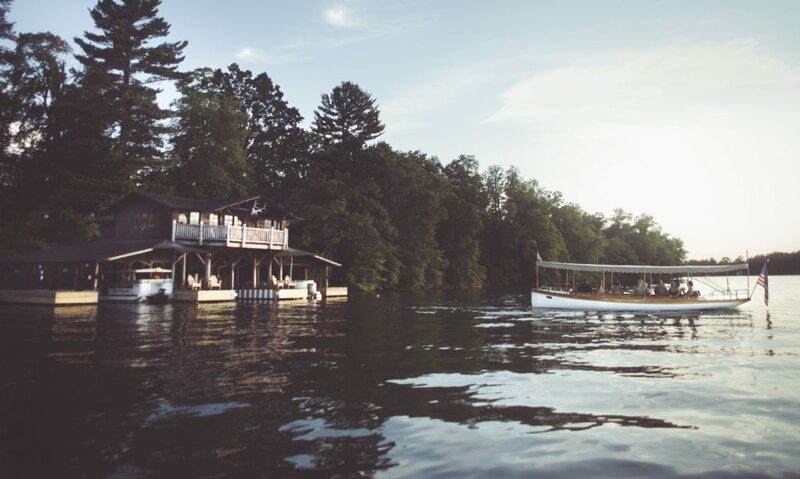 You can either rent the boat ride exclusively for your guests, or guests can sign up on their own with the boat running every day for a morning, happy hour, and sunset cruise. Stout’s Island Lodge partners with local licensed fishing guides to provide group fishing experiences. 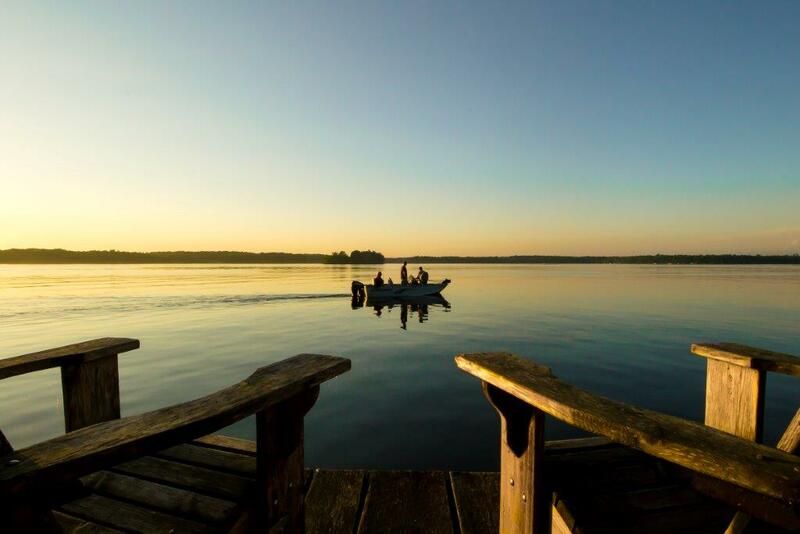 Licensed fishing guides have over 30 years’ experience fishing the lakes of Barron & Washburn counties, where Walleye, Northern Pike, and Panfish await. Great for groups large and small, your guide will pick you up and drop you off on the Island and provide all necessary equipment for a hassle-free event. Just a short pontoon ride away, enjoy a cruise on our open pontoon over to Tagalong Golf Course. 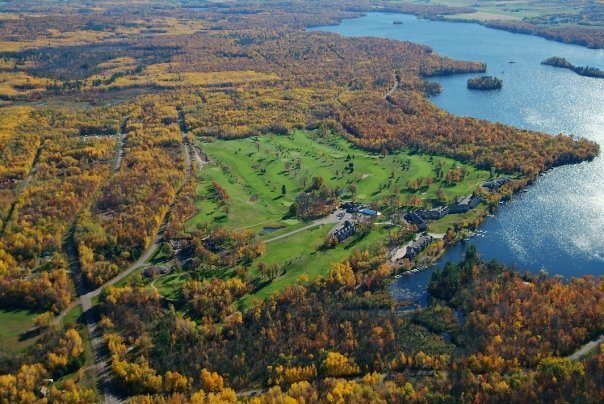 Nestled on the beautiful shores of Red Cedar Lake and modelled after the famous St. Andrews course in Scotland, Tagalong was built by our very own Frank Stout. Enjoy a quick 9 holes or a full 18. Whenever you are ready, give us a call and we will ferry you back to the island.